A US Fighter Jet or Russian Mig? A Blackhawk Helicopter or a P-51 Mustang? A F-16 Eagle or a F-14 Tomcat? A Korean or a Russian Tank? Is a Modern Tank Faster than the WWII Helicopter? How about an Apache Helicopter vs. a WWII Plane? What’s Faster is the interactive game suitable for all ages that puts players in the driver’s seat. It’s a race between two objects—you try and determine which one is faster. With the upgrade, players choose from categories such as cars, motorcycles, aircraft, jets, tanks, animals, fish, athletes, helicopters, roller coasters and much more. 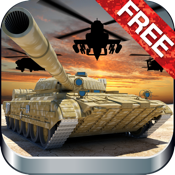 This Lite Military version includes planes, helicopters and tanks. To be able to earn other rounds you must upgrade inside the app to the full version. If you run out of the 50 included radar guns, more are available for an in-app purchase.